I started this as Minecraft meets Little Big Planet, where you have a Minecraft style game in a side scroller that is three layers deep. There was a lot to do get something playable. The entire Minecraft 3D mechanic had to be built and then constrained to only 4 meters deep. The need to aggressively combine meshes is not required as there is always a lot less on the screen. However, getting the lighting right was quite a bit harder. In the video, you’ll notice that the sunlight is nice and steady, fading out at night as expected. 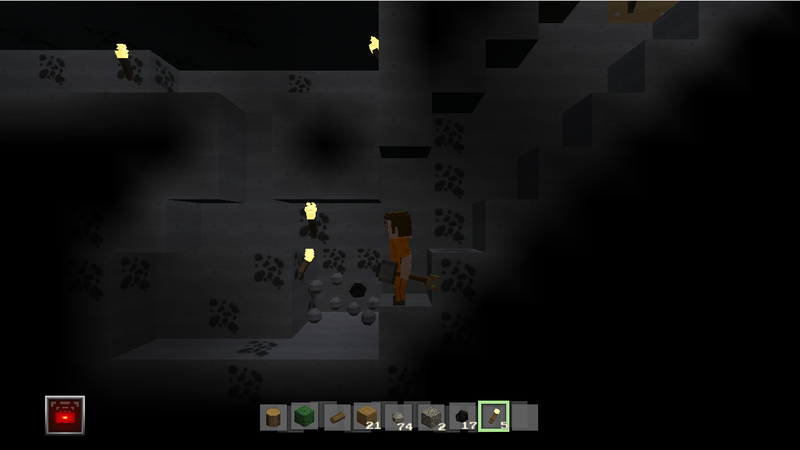 In the caves, the torch light has a subtle flicker to it which is applied via a Shader. The shader itself is also keyed to the show the foreground block beneath the surface. This is also handled in the shader for performance reasons. In the final frames of the above vide, you’ll see the developer view which also shows a cutaway of the lightmap that is created from torches and sunlight (red and green channels respectively). This lightmap along with the current sunlight and torch colors are fed to the shader each frame.